November 2011 | Residents of the el-Khosos community, one of the four communities that WITNESS is supporting in Cairo, staged a successful protest at the Governate office. The activists demanded that they not be forcibly evicted a second time; receive right to tenure over their current homes where they were resettled by the government; and that either their accommodations be upgraded to meet basic needs, or that residents be allowed to actively participate in a resettlement plan. The following day, the Governate issued documents giving the community the legal rights to their home. While the protesters were waiting to speak with the Governate, community members screened a rough-cut of a video, co-produced with WITNESS and Habitat International Coalition, to the assembled protesters. After receiving the right to tenure over their land, activists worked with Amnesty International to re-edit the video so it could be used for broader campaigning purposes. 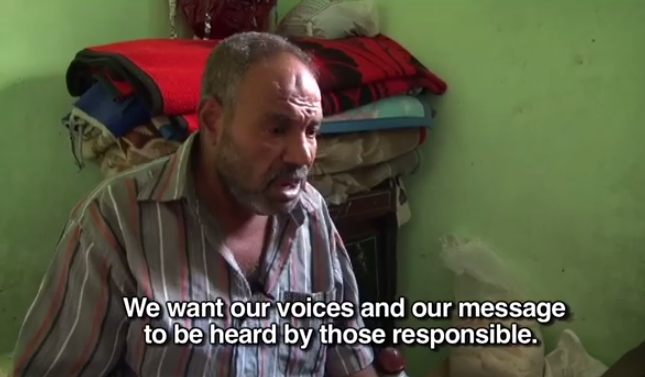 El-Khosos is one of four communities that participated in an 8-day video advocacy training in July. Watch a video about the training here.